In the just concluded test between Pakistan and the West Indies, Younis Khan became the 13th batsman in the world, and the first batsman from Pakistan, to reach the coveted feat of 10,000 test runs. All of the 13 batsmen have captained their countries in test matches. All of them, besides Kallis, have been appointed full time test captains for their nations. Kallis filled in on 2 occasions. Younis, Lara, and Jayawardene were the only batsmen who had scored a triple century by the time they reached 10K. Besides Kallis, each one had scored a double hundred. Ricky Ponting had the most centuries (35) by the time he reached 10K. Younis, Sachin, and Gavaskar had 34 each. 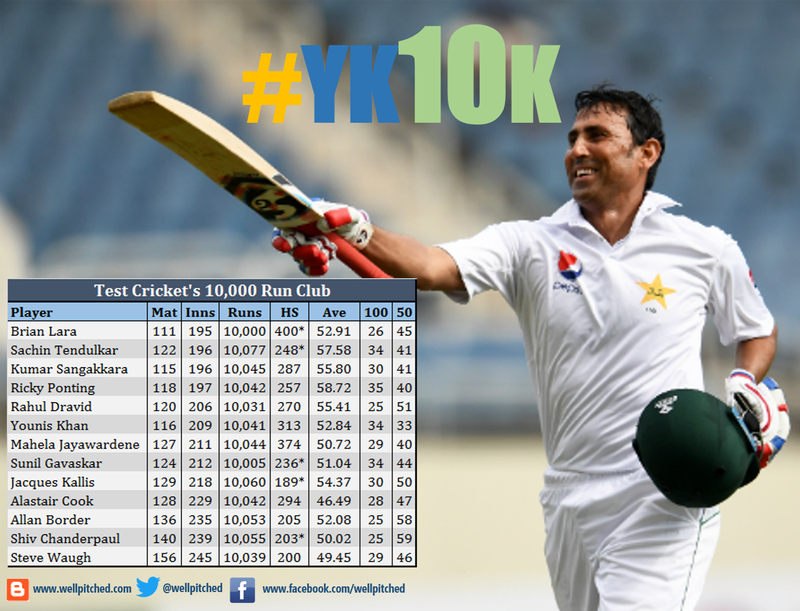 Younis Khan has the best 50 to 100 conversion ratio among the batsmen in the 10K club. Steve Waugh and Alastair Cook are the only batsmen that were not averaging 50 at the time of reaching 10K. Younis Khan's 70 sixes at the time of reaching 10K are the most sixes hit at the time of reaching 10K. Alastair Cook and Sunil Gavaskar are the only openers in the 10K club. Ricky Ponting had the best average on reaching 10K. Waugh, Cook, Border, Lara, and Ponting were all captaining their country when they reached 10K. Only Steve Waugh and Rahul Dravid scored hundreds in the innings they scored their 10,000th test run. Cook, Lara, Kallis, and Jayawardene are the only members of the 10K club who did not score at least a 50 in the test they reached 10K. Brian Lara reached 10K the fastest in terms of innings. Cook, Tendulkar, Jayawardene, and Younis Khan are the only ones who were part of the winning side in the test where they scored their 10,000th run. Younis Khan, at 39 (officially), is the oldest batsman to reach the landmark. Sunil Gavaskar reached 10K in his second last test match. Younis has done so in his third last. There could not have been a better ambassador than Younis Khan from Pakistan in Test Cricket's 10K Club. He is not more talented than the likes of Inzamam, Yousuf, and Miandad; however he is the most hardworking, determined, and dedicated batsman to ever play for Pakistan. He is the best batsman to represent Pakistan in test cricket.